DEC 7th FIRST FRIDAY 6 - 8 PM ~ CANDY COTTAGE ~ GOLDEN TICKET POP UP + HOLIDAY WORKSHOP ~ Drop off + Ages 6 & up (SOLD OUT)! UPDATE 12/4: EVENT CURRENTLY ON WAITING LIST ~ EMAIL HELLO@HANDMAKERY.COM! ALL SEATING is currently on a waiting list (email hello@handmakery)! Reservations after November 10th, 2018 will be seated at our "studio side table" which is still absolutely wonderful, just not the center/main table of the studio, but has plenty of work space. Last year's event sold out in a matter of minutes, really!!! Be sure to get a jump start on this event as it's back by popular demand! This event has been available on our website for enrollment since August 2018. Early enrollment is ideal for securing a space in this "limited seating" event. GOLDEN TICKET EVENT LIMITED TO FIRST RESERVED! 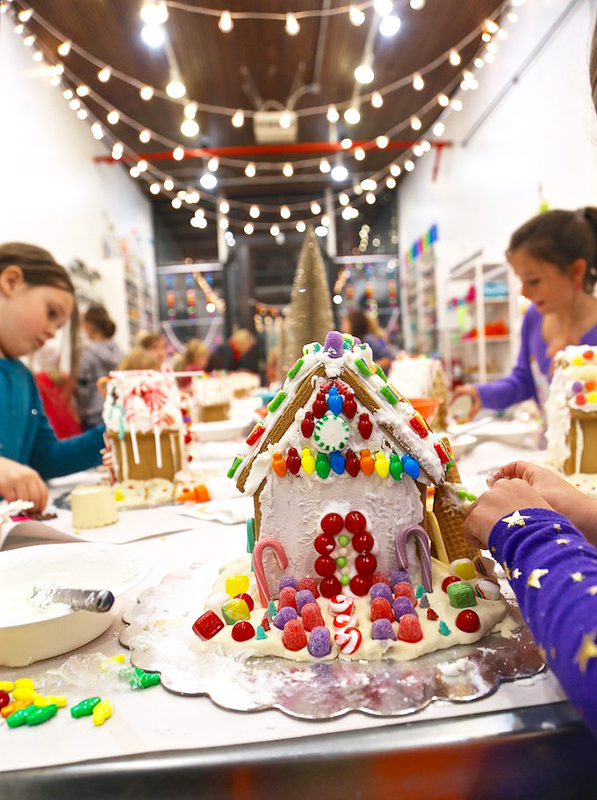 ~ Children's Holiday Pop Up Event + Craft Night Under the Stars + in the Studio! Theme: HOLIDAY CANDY COTTAGE WORKSHOP ~ home sweet + snowy + savory + sweet home! We look forward to decorating a sweet + colorful + candy cottage with snowy trees and garland, using traditional gingerbread + icing + candies galore as a winter wonderland takehome! Join Us: For a holiday + pop up ~ Craft Night: Under the Stars + In the Studio! Offered as an extra special ~ creative + cozy + community + collaborative + colorful + child-focused ~ artful + eventful evening! Ages 6 & up. Reserved seating. Please let us know if your child would like to sit by a specific friend. Drop off event. Beautiful Bonus: Parents get to drop off + stroll the streets + dine + drink + date night in downtown Carbondale after joining the traditional tree lighting and visit with Santa at the Launchpad! Everyone can then see highlights of the night on Instagram @handmakery! See a photo of last year's BIG night!!! Drop your children off at the studio and dine or date night with that special someone! Ages 6 & up! We'll enjoy a special evening crafting in the studio with a different special project each night! Join us for Carbondale's First Friday ~ December by reserving tickets today! You'll be so happy you did and so will your children! CONNECT WITH OUR STUDIO: We'd LOVE for you to connect with us @handmakery on Instagram, join our blog and newsletter, and of course email us anytime at hello@handmakery.com!